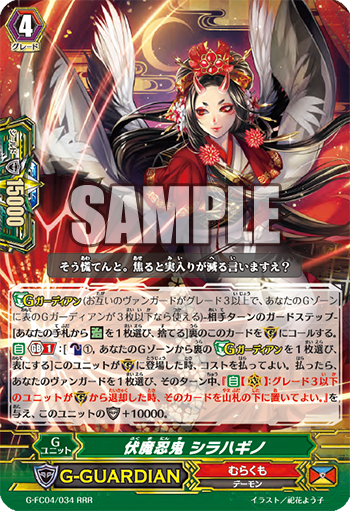 A powerful Heal Trigger and G Guardian for Murakumo appear together, supporting the Clan’s duplication strategy by recycling Units back into the Deck. AUTO Generation Break 1: [Counter Blast 1 & Choose 1 face-down G Guardian from your G Zone, flip it face-up] When this Unit is placed on (GC), you can the cost. If you pay it, choose 1 of your Vanguards, during that turn, it gains “AUTO (VC): When a Grade 3 or lower Unit is Retired from (GC), you can place that card on the bottom your Deck.” and Shield+10000. AUTO: When you discard this card from your hand for the cost of Calling “Ambush Demon Stealth Rogue, Shirahigano” from the G Zone, you can choose 1 Normal Unit from your Drop Zone, place it on the bottom of your Deck. For Today’s Card, we’re introducing the following from “Fighter’s Collection 2017” (on sale May 12th, 2017): The Generation Break 1 《Murakumo》 G Guardian, “Ambush Demon Stealth Rogue, Shirahigano” and the Heal Trigger “Secret Stealth Rogue, Higano” that activates its ability when it’s discarded from the hand for the Cost of Calling the related G Guardian. [Orange] Flip 1 face-down G Guardian in the G Zone face-up! [Yellow] Activate an effect at the time you discard a Heal Trigger from your hand! When “Ambush Demon Stealth Rogue, Shirahigano” appears, you can activate its ability by Counter Blasting 1 card and flipping 1 G Guardian in your G Zone face-up! During that turn, when a Grade 3 or lower Guardian is Retired, you can place that card on the bottom of your Deck, and Shirahigano gains 10000 Shield. Keep in mind that it lasts for that turn, meaning it keeps happening even after you’ve Called and used “Shirahigano”. Since 《Murakumo》 is a Clan that specializes in Calling copies of the same card from your Deck, abilities that return cards back to your Deck are extremely strong. Keep in mind this allows you to even return Triggers! And since its Shield jumps up to 25000 or more, “Shirahigano” can feint most attacks. Continuing with this, you can activate the ability of “Secret Stealth Rogue, Higano” when it’s discarded for the Cost of Calling “Ambush Demon Stealth Rogue, Shirahigano”! You choose 1 Normal Unit from your Drop Zone and place it on the bottom of the Deck! It allows you to secure the duplication ability of “Stealth Rogue of the Trial, Yasuie” ahead of time! Q. Can you discard “Secret Stealth Rogue, Higano” for the Cost of Calling G Guardians other than “Ambush Demon Stealth Rogue, Shirahigano”? Q. Can you Call “Ambush Demon Stealth Rogue, Shirahigano” while you have no face-up G Units? Q. When there are 3 face-up G Guardians in your G Zone, can you activate the effect of “Ambush Demon Stealth Rogue, Shirahigano” by flipping a G Guardian face-up?